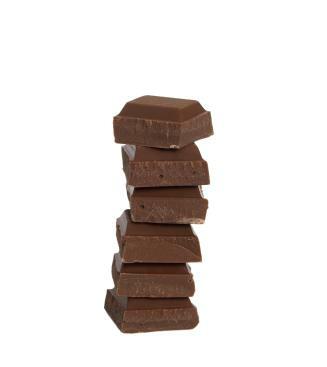 Chocolate calcium supplements have become a popular way for people to get their daily intake of calcium. Many manufacturers make the chewable chocolate, and consumers enjoy eating a piece of chocolate rather than swallowing a bulky pill. Are these calcium supplements right for you? Many people know calcium is important to prevent osteoporosis, and strengthen bones and teeth. As the most abundant mineral in your body, calcium plays other essential roles, as well. It helps blood vessels contract and relax. It is also a key nutrient for muscle contraction, including contraction of your most important muscle, the heart muscle. Calcium also helps regulate nerve function and assists in proper blood clotting. Clearly, getting adequate calcium intake is essential to good health. Dairy products, almonds, canned fish, soy products, and dark leafy greens all contain calcium. The National Dairy Council recommends eating two to three servings of low-fat dairy products every day in order to get adequate calcium. The USDA has also established a recommended daily allowance and an upper limit of calcium consumption. The recommended daily allowance for calcium is 1,000-1,200 mg per day, which is the minimum amount necessary to avoid calcium deficiency. Low levels of calcium can result in fracture, bone weakness, and osteoporosis. The upper limit is 2,500 mg per day. Taking calcium above this limit could result in toxicity. Excessive calcium intake may lead to kidney stones and heart disease. New research released in December of 2010 suggests that many Americans get adequate amounts of or too much calcium. Chocolate calcium supplements are a brilliant way to get people to take their calcium. The supplements have the taste and texture of chocolate, but contain about 500 mg of calcium. Chocolate is also loaded with antioxidants, so taking this type of calcium supplement can leave you feeling doubly virtuous. Many also contain vitamin D, which helps increase calcium absorption from the gastrointestinal tract and confers additional health benefits. Various options exist. 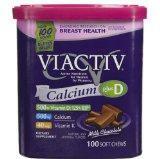 Viactiv chocolate chews were one of the original chocolate flavored calcium supplements. Similar in taste and texture to a Tootsie Roll, each Viactive chew contains 500 mg of elemental calcium from 1,250 mg of calcium carbonate. The chews also come in caramel, raspberry, and chocolate mint flavors. Adora chocolate calcium comes in both dark chocolate and milk chocolate. The 30 calorie supplements are vegan, lactose, casein, and gluten-free, and contain 500 mg of calcium, 250 IU of vitamin D, and 40 mg of magnesium. Adora's supplements are similar in taste and texture to a chocolate bar. Many grocery and drug stores, such as Trader Joe's, have their own calcium chocolate supplements made from ingredients similar to the major brands. Chocolate candy-styled calcium supplements taste so good you may be tempted to take more than recommended. Since too much calcium can potentially cause health problems, it is important you factor in the calcium you eat in foods with your supplement when determining how much calcium you take in daily. If you eat a balanced diet containing two to three servings of dairy, chances are you do not need to supplement with calcium. Since many of these supplements also contain vitamin D, if you are taking another vitamin D supplement, you may get too much. Talk to your doctor about your calcium and vitamin D intake levels, as well as your specific health picture to determine whether or not you need supplementation.